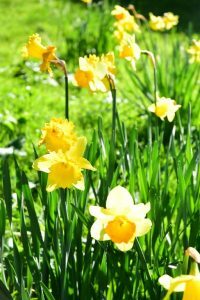 So 3 years ago I posted some nice Welsh daffodils in our sunny spring garden and here we are again. A week to go before Anne and I jet off to New Zealand for a month. We’re only doing North Island this time, which is a bit of a shame as we love the scenery in South Island. But even so we’re having trouble fitting in everything that we want to do north of the Cook Strait. We’re flying from Heathrow next Saturday to LA, a 3 hour stop-over there and then going straight on to Auckland. About 29 hours in total which is pretty daunting. Though we decided to splash out and pay for Premium Economy on AirNZ this time. Their seats on the US route look pretty amazing, so I’m hoping that we will cope OK.
Keep an eye out for regular posts, though WiFi coverage can be a bit poor in some areas. NZ hotels still charge for wifi access which is a bit old-school these days. Just skimmed thru the great pics taken in 2014. Recognized some of the places I’d been myself. Enjoy your 2017 tour.